Today’s run with Darrel was a good test for these new addition’s to the Bleakman household. The Mooney Mooney to Patonga leg has it all in terms of trail running; uphills, downhills, fire-trail and technical all thrown into one lovely 25km run. Initially I was going to do the return leg, but waking up this morning, I still felt a little on the rough side from the illness this week and began to think that the back half could end up being a bit of a death march – so I agreed with Darrel that a ‘harder’ 25kms would be better than an average first 25km and a God awful last 25kms. It can be hard to listen to your body sometimes as we become obsessed with distance… still that’s a discussion for another article I feel. This isn’t a full review as such, but I just wanted to pen some thoughts after their first outing. The upshot is that these shoes are freaking great. I knew that the fit and feel would be good having worn the Talon 190s quite a bit in the last six months, and these are pretty much the same shoe minus the Talons on the undersole. The only slight concern I had, was if the undersole would have enough grip over the wet and slippery rock plateaus as you head to Patonga. The good news is that it was pretty wet along the trail, and a lot of the rocks on the plateaus were soaking wet too, which meant I could give these a really good going over. They passed the test with flying colours! In the past, wearing the Nike Free 3.0 over some of the slippery rocks has meant that ice skating lessons were almost obligatory before you ventured up to this part of the course. With the F-lite 195s, the sole grips onto these wet rocks as if you had a pair of Talon 190s on. This is a massive boost to me in that I know I can be pretty confident of these shoes when charging downhill and across wet terrain. The sole has what appears to be lots of very little tiny traction bumps along the entire sole. It’s probably these that able you to run full pelt along very wet rocks and terrain. Tick that first box. The second area of thought for these shoes was whether or not there was enough protection on the underside of the shoe to withstand loose rocks and gravel. There’s no better place to take these than through that first 10kms of technical track as you leave Mooney Mooney. I think I’m at an advantage because I’ve worn Frees for the best part of two years, but there was no discomfort at all when gliding over the loose rocks. Yes, you do feel the odd pointy rock or stone, but no more than any other shoe I feel. One of the real bonuses of these shoes is that the actual sole is very spongy and rubbery, very much like the Nike Free, but there appears to be this final hardened layer on the sole, which gives extra durability and protection too. However, this is not at the cost of being able to squeeze the entire shoe into a ball if you so wished. In short it’s tough, but very flexible. That’s it for now, I’ll post a much more comprehensive review once I’ve got a 100 or so kms in these little beauties. BUT, I’ve pretty much decided that bar any major flaw, these will be the shoes for GNW. I think they rock as they combine everything I need, toughness to last a beating on the GNW, yet subtle to flex and mould around your feet. If the Talon 190s are anything to go by, these shoes shouldn’t break apart either like most minimal shoes seem to. Inov-8 I think have really hit upon the perfect combination here and succeeded where the likes of Nike and New Balance have failed in delivering a rough and ready shoe, but that has the touch and build of an artist putting the finishing touches to a future masterpiece. Is Kilian Jornet unbeatable or are we all too soft ? Thanks Dan for the preview. They sure sound promising. Harping on the fit still I notice they look pretty narrow through the waist/arch area. That is fine if it is soft and malleable but some shoes have a hard reinforcing rib here that digs into the arch of those of us with low arches. Any worries there? You are getting me excited about these so I am hoping not to be disappointed. And did they survive Darrel’s jokes? That is the real test, surely. No hard lining at all Whippet, the shoe really can be scrunched up into a ball. The only bit of slight reinforcement on the shoe is some plastic lines that make up the Inov-8 logo, but they’re more for show than design. How about I bring my pairs up to Glasshouse and you can have a look. What size are you? if you’re between US 11.5 and 12, you can try them on if you like. They motored past the Darrel joke test too. These shoes are made of stern stuff. Not one joke in TW on Friday.I was at the back for around 90km’s of the 100..
Cant wait to give them a try Dan, after my Nike 3.0 left their cogs and wheels all over the trail somewhere near The Basin, I took my Talon 190’s from The Basin to Congewei return on Saturday and with the dryer warmer conditions, I noticed the ride was a little too harsh in the final kms. So with my final shoe choice yet to be finalised, these definitely need a closer look. As for my backpack choice, my new Salomon S-LAB 12ltr pack is the bees knees but more of that to follow in a new review soon. Just a bit of addition for the article. I can say these are one of the best shoes I have ever had till now. I use them for road running, racing, loads of trail running over the rough rocky trails of the Mediterranean coast. There are 2 cons near all the pros. 1. If the trail is really muddy, and covered with leaves, or you are running on very wet grassfield, there is no grip at all. At this time the X-Talons or the Baregrip do the job. 90% of the trails (except England, Ireland or anywhere in deep winter time) are manageable with the shoes. After around 800K the nose of the shoe is fully detached from the mesh, the toe protecting layer is cracked everywhere. The white markings around the sole is coming down. The sole still holds up, I guess it needs around 4000K till you run a hole on the sole. Despite these, it is still functional, I currently have around 1000K in the shoes since March, and will have at least the same amount in it. After a wash it would even look like new. My longest run in them currently is 45Km trail, absolutely no issues, no blistering. Extra: These are my first shoes that I didn’t remove the insole from it. It is just perfect as it is. At least for me. Thank you for welcoming. I have found your site about 3 weeks ago, I really like it and follow it regularly. Well done for the job, and keep it up. Dan, really pleased to read your comments on how they held up on trail. Mine have only seen bike path and fire trail so far, but are at this stage a definite favourite. I love the Talon 190s on trail, but most of my longer trail training runs include a few kms of road to get there and a fair amount of hard fire trail, so not the ideal conditions for the Talons. First impression was definitely very positive in pulling them on, the slight stretch in the upper gives that instant feeling of comfort & no pressure points just like the Talon 190. While not quite as spongy a ride as Free 3.0s on road, they certainly give a softer ride than other light shoes that I have tried and suit my mid/forefoot strike. Another big positive for me is that sole design does not collect gravel unlike my Frees that regularly need gravel emptied from the tread pattern. I need to get some longer trail kms up in these, but can certainly see at this early stage it being a toss up between these and the Talon for GOW. Certainly a great lightweight, but sturdy shoe for courses with mixed surfaces. Btw, I don’t think we should compare shoe collections….I do however feel mine now is more balanced having found a shoe other that the Frees that I like for road or mixed training, so perhaps will stop expanding so quickly and I can just continue to expand the other necessary gear…..packs, lights, gloves, compression, so many options. Thanks for commenting Bryony, seems like we wear a lot of the same shoes 🙂 You’re right about the stretch in the mid of the shoe when you pull them on. To be honest, Ive never really thought of them as a narrow show, and this is coming from someone who won’t wear New Balance because I think they tend to be a narrow fit. But maybe that was just my experience. I love these shoes. Podiumed in them at the Willy 2 Billy on Saturday in fact! I reckon you already know how they’re going to feel. I also had them on for Willy 2 Billy, not quite a podium, but a solid outing non-the-less. Very very versatile shoe, have run a 5k road PB in them, trained on all surfaces in them and a couple of trail races. Performed great. My only gripe is the insoles, the little perforations catch tiny rocks/grit and can rub on the sole of your foot. Im yet to get a blister (even after NF100 I’m my Talons which have the same insoles) but annoying/niggling regardless. Over all though, I love them and the 195’s have become my main runner, except when the trail gets too wet and I’ll roll out the talons! Great review and comments. After doing 100k at GH last weekend in NB minimus, I decided that I need a shoe for GNW of similar fit and feel but more protection from stones – so have ordered these 195s. In red of course. Ok Dan / Marcus , what’s the final consensus on these shoes? They seem to be getting a lot of love from all corners. They look sharp, made well, run well. Any final thoughts before I think about ordering a pair? I just filled a massive black garbage bag with 14 pairs of shoes so the cupboard needs refilling. Full review coming Vizey… need to put some more kms in them, but put it this way. 64kms pretty much straight out of the box and they’re looking like a good shoe. They are minimal, that takes some getting used to. Got the Roclite 295s on order as a comparison. Dan – I found that my x-talon 190s split at the sides disappointingly soon and my little toes now hang out the sides (I’ve got wide feet and the same thing happens on my frees). I’m looking to replace them with a shoe that has the comfort, fit and ride of the 190s, the sole and grip on wet rocks of the f-lite 195s but with a bit more durability in the upper mesh at the widest point of the forefoot. Have you found anything amongst the inov-8 range that sounds like that? Gotta say I’m so sad not to be wearing the 190s anymore … they were the mutt’s nuts. Hey Sue, your comment timing is excellent as I’m about to pen some more thoughts on the 195s over the next few days now that I’ve had chance to put a few hundred kms in them. Sorry to hear that they’ve split on you. 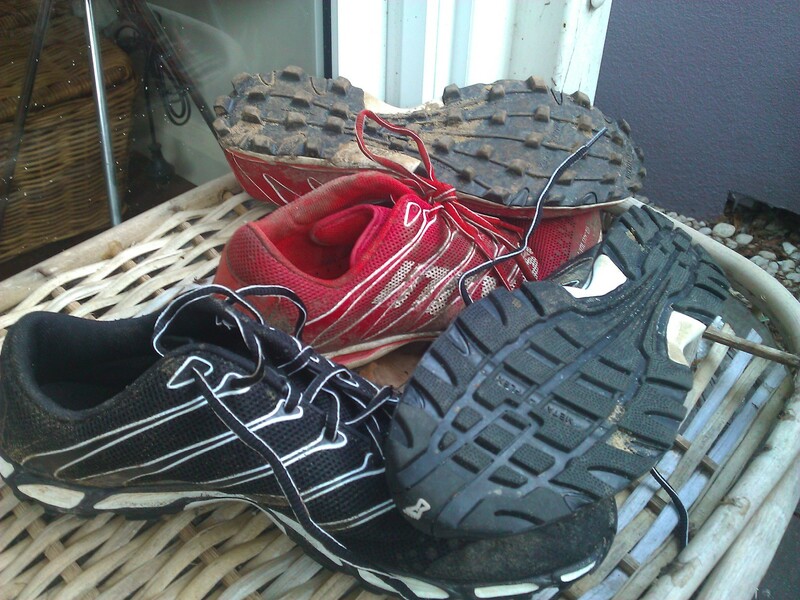 I have the same issue with Frees, although some pairs have lasted me nearly 1,500kms, yet others last a few hundred. It’s weird. I do think that if they get wet and are not allowed chance to dry properly, that can cause splitting issues, but yet to see any issue with my Talons right now. As it happens, I’ve got a pair of Inov8 Roclite 295s on order, and they seem to be a ‘suped-up’ version of the 195s. I’ve read a lot of good things about them, as they offer more cushioning and also seem to have a lot more durability around the upper mesh too, plus the heel to toe drop is not as severe as the 190’s or 195’s, and is more akin to the drop that the Frees have. Hopefully they arrive this week and I can give them a good workout over the coming weeks too. I’m fast making my mind up though that the 190’s and the 195’s are only good for up to 50kms. They’re a great racing shoe and I love wearing them, but after 5-6 hours in them, you do start feeling it, particularly on the hard-packed trails of the GNW. Hopefully a little more cushioning on the 295s will help here. I love Inov8 shoes, I think they’re the bees knees. My husband trained for and did Kokoda Challenge in the Roclite 295s and liked them a lot. I’ll be really interested to hear how you find them after running in the lighter 190s and 195s.